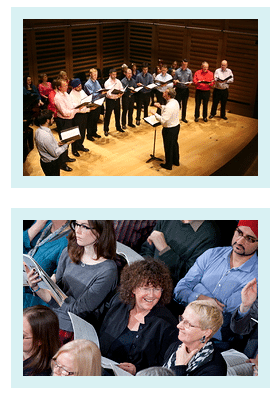 Not sure which choir you'd like to join - Oratorio Choir or Jazz Choir? Unsure whether you'll be able to keep up during rehearsals or which voice part you sing? We welcome prospective members for a taster session so they can assess whether we are a good match! How do I apply for a taster session? 1. You contact us in advance by email or phone to let us know you're interested. 2. We confirm by email or phone before the first rehearsal and send you all the information you need, where to come, what to bring, etc. 3. On the night, we allocate you a buddy in the same voice part who is going to show you around and share music with you. 4. During the interval, tasters have a very quick 2 minutes voice test with David Wordsworth and/or Matthew Hough, to check they are singing the right voice part. You will be asked to sing/repeat a few notes played on the piano and to clap a simple rhythm. David and Matthew will advise you on the right voice part, and whether you could benefit from joining another class, for instance the Learn to Read Music class if you have no previous experience of reading a score, or the Vocal Development class if you have never sung before and need to build up your confidence. 5. At the end of the rehearsal, you need to decide whether to join or not (or at the latest by the Friday of that week) and if you do, you'll fill in a form to enrol and we'll explain to you the payment options (online bank transfer is preferred). This is necessary so we know how many scores and rehearsal CDs to order for the next rehearsal (and in order to minimise disruption to other members who may have to share a score with you). Our terms last 10 weeks, so it's important to enrol within the first 2 weeks - in the Oratorio Choir for instance, we have 130 singers and for concert logistics purposes, it's crucial to get organised straight away. If you feel you're not ready to join yet or you have other commitments you can't get out of, we'll understand and it's perfectly fine to enrol the following term.